3) The first person that told me that Matthew, then three, was developmentally delayed was a speech therapist. She was also the first person who didn’t mention how adorable he was. 4) My husband and I coached Matthew before his next evaluation with a child psychologist. We read him Richard Scary’s Best Word Book Ever. 5) When the child psychologist confirmed that Matthew was developmentally delayed, I thought that meant he could catch up. I really did. 6) When Matthew started lining up toys and laughing too hard at sprinklers in the garden, I knew something was seriously wrong, but I didn’t admit it to anyone. 7) I was angry with him, and I felt guilty that I was angry. 8) When Matthew’s younger brother Andy charmed family and friends with his personality and smarts, my love for Matthew deepened. 9) Andy is now 22. My most cherished childhood memories with him are the walks we took while Matthew was with speech therapist/psychologists/occupational therapists etc. 10) Matthew’s youngest brother, John, was one week old when we tried our first miracle cure, auditory training. He is now 18 and helps Matthew with cheats on Sonic and Knuckles. 11) Andy is studying genetics. He is kind and funny. Matthew is jealous of him because he has friends and a drivers license. 12) My husband I have stayed together-I hear that is unusual. 13) The year that I accepted that Matthew’s condition was lifelong was also the year I had a mini-breakdown. 14) The best thing I ever did was find a good therapist. 15) My exercise routine has saved me. 16) My sense of humor has kept me sane. 17) There is nothing more genuine than one of Matthew’s smiles. 18) There are more kind people in the world than there are jerks. 19) I cried at every IEP except for the last one, which would be THE last one. 20) Even then they blamed vaccines. I never did, and I still don’t. 21) I’ve met some of the best people because of Matthew. 22) When Matthew tells me he’s not in trouble, I know that he IS in trouble, and I remain calm. 23) I am one of the most patient women on the planet. 24) I am luckier than most. 25) The lump in my throat will never go away. 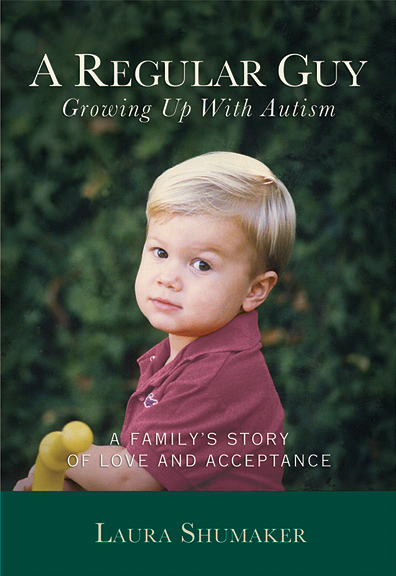 Laura Shumaker is the author of A Regular Guy: Growing Up With Autism, a memoir about raising her autistic son, Matthew, from babyhood to young adulthood. She writes a nationally recognized autism blog for the San Francisco Chronicle and is a frequent guest blogger for Autism Speaks. Her essays have also appeared in the The New York Times, the Contra Costa Times, The Autism Advocate, on cnn.com, and in myriad anthologies including Voices of Autism, Cup of Comfort and Gravity Pulls You In. Laura speaks regularly to schools, book and disability groups and lives in Lafayette, California with her husband, Peter, and her three sons. I can relate to the emotions shown in this listing, being a mother is difficult, but in the end, it is the BEST thing in the world! Although I can relate, I didn’t have it as emotionally tough in the beginning as most mothers of autistic children do (and I am thankful for that, I didn’t have to feel some of the feelings such as denial, shame, or anger). I guess I am the different breed and have always been accepting and open-minded about my sons autism. Perhaps because I work in health research, perhaps because I studied psychology, perhaps because my MIL was a social worker… or perhaps it is just me, but I never once flinched at the notion–I just followed through on everything calmly as if it were a normal process. When I noticed my son’s regression, I just began studying him more in depth, taking him from Doctor to Doctor for them to tell me he was autistic–but they didn’t (I am mother to twins born premature @30 weeks–so they just kept telling me that he was developmentally premature–yea, right! i knew that was not so). So I was determined to keep getting him services such as speech therapy that were offered to developmentally delayed children, and kept on studying autism… then, I began to focus in more on getting my son supports and therapy and ready for school so that he can progress educationally–that is important to me. I learned how to teach him and how to communicate effectively with him, and I taught that to others who came in contact with my son. Finally after many different diagnosis’s, we got a GOOD developmental pediatrician who, like me, recognized–and admitted that yes, he is autistic and we got our formal diagnosis at age 6! My son is 11, going on 12, he has a twin sister who has greatly improved (saved) his social skills through the years That in itself was/is a HUGE blessing–she forces him to socialize (as do the rest of our family members–he doesn’t get any slack in the household that’s for sure ;)). My son is incredibly smart (scary smart) and has done VERY well educationally so far, and I am so proud of him! I love my children all the same, I treat them all the same, and I hold them accountable all the same. Every child in the world learns differently and is different and unique… and we as mothers learn and know our children inside and out, raising children–in general is difficult, and I am loving every moment of my journey as a mother It is nice to read other mother’s thoughts and emotions–warms my heart. many Blessings to you! (Love #22… we do that one too :)) xo’s). It sounds like you have an excellent outlook and people could really learn from your experience. My husband and I stayed together, but then my husband had a stroke and died when he was only in his 40s. What do I do now? I am sorry to hear about your loss. Please look to stay as active and physically fit as you can. Remember that you should never take your health for granted. Please look to our website for any resources to help get you going. My husband and I didn’t split up. But he died at age 48. Now I have a nine year old with autism and a 16 year old that rarely gets out of bed.